These are the voyages of the catamaran "Dos Gatos" with her crew: Martin, Ginger, and Tigger the cat. We're just back from a trip to see Canaima National Park and Angel Falls -- the highest waterfall in the world - 1000 meters. This trip was originally scheduled for last Sunday but late Saturday the tour operator changed our pickup time from 8:30am to 6:15am. We didn't get the message and missed the trip. But we stayed around a few more days and were picked up today at 6:30am. Canaima is a huge national park in the southeast of Venezuela, close to the Brazilian border. Some major topographical features we saw from the air are Tepuis -- large flat-topped mountains steep-sided and covered in rain forest like "The Lost World". Angel Falls drops over the side of one of these. Angel Falls itself is a multi-day hike. 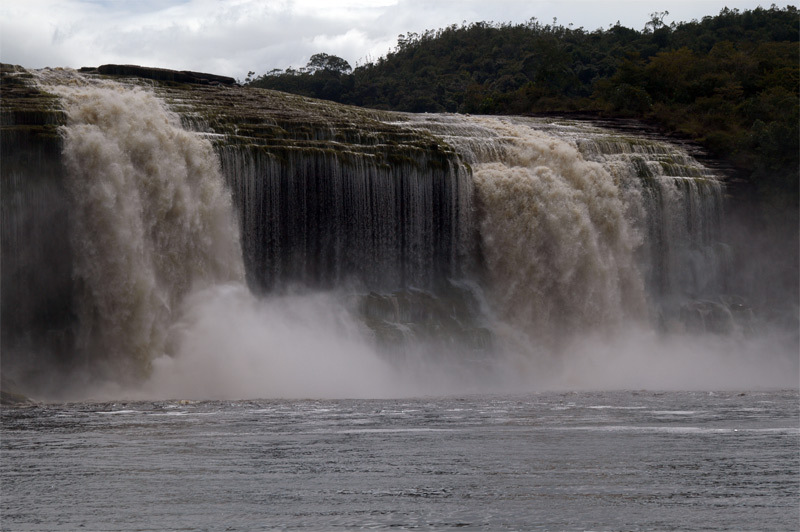 We opted for a day trip to Canaima which included a fly over Angel Falls. We flew from Margarita in a twin-turboprop Jetstream 31 in a group of 18. When we reached Canaima, the plane bumped around in the cloud over the mountains for a while before the pilot announced that conditions didn't favor a fly by Angel Falls. We landed. Our visit to Canaima included a powered-canoe trip across Lake Canaima, past 5 beautiful waterfalls, a hike to a river beach for a swim, and a hike that took us under a small waterfall to get a refreshing shower. After lunch, we visited the indigenous craft store and then went back to the airstrip. After takeoff, our pilot was able to give us a view of Angel Falls by flying down inside "Devil's Valley". Then we flew the 90 minutes back to Margarita. We rely on Paul Humann's Reef Fish Identification to name the fish we see on a dive. We'd noticed that there were a remarkable number of pictures attributed to Isla Cubagua, Venezuela. Isla Cubagua is a very small island about 25 miles west of Parlomar on the south side of Margarita. It really has only one dive site, a pair of wrecks sticking outo of the water at the north end of the beach at the island's best anchorage. There are no reefs, no majestic walls, the rest of the low lying island seems to have a few coral heads and some algae. 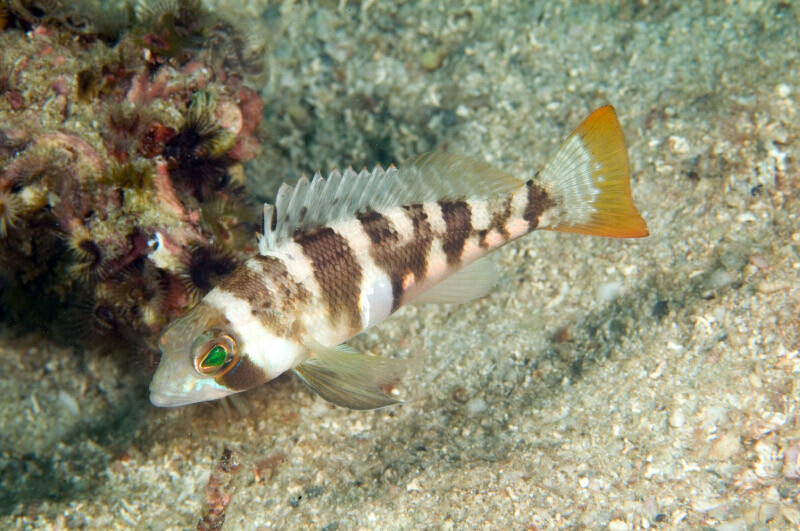 Saddle Bass, Resh Pikeblenny, Chameleon Blenny, Spikefin Blenny, Red Banner Blenny, Spiny Sailfin Blenny, Blackringed Goby, Sapo Bacon, Sapo Cano, Sand Perch, Silver Porgy, Bronze-striped Grunt, Latin Grunt, Emerald Parrot Fish, Vieja, White Grouper, Comb Grouper, Banded Jawfish, Spiny Founder. The Saddle Bass (pic above) is remarkable. Paul Humann says "Generally known from 250-750 foot depths. The only shallow water sightings are from Cubagua at 20-80 feet and Alligator Reef Light, Florida Keys at 145 feet." We were at 40 feet on Cubagua and there they were - 3 or 4 of them. Wierd! So, the bottom was muck, the wrecks not special, the visibility was poor -- but the fish spotting was great! Go figure. We have left Trinidad -- probably for the last time; we've spent more time in Trinidad in recent years than any other country. 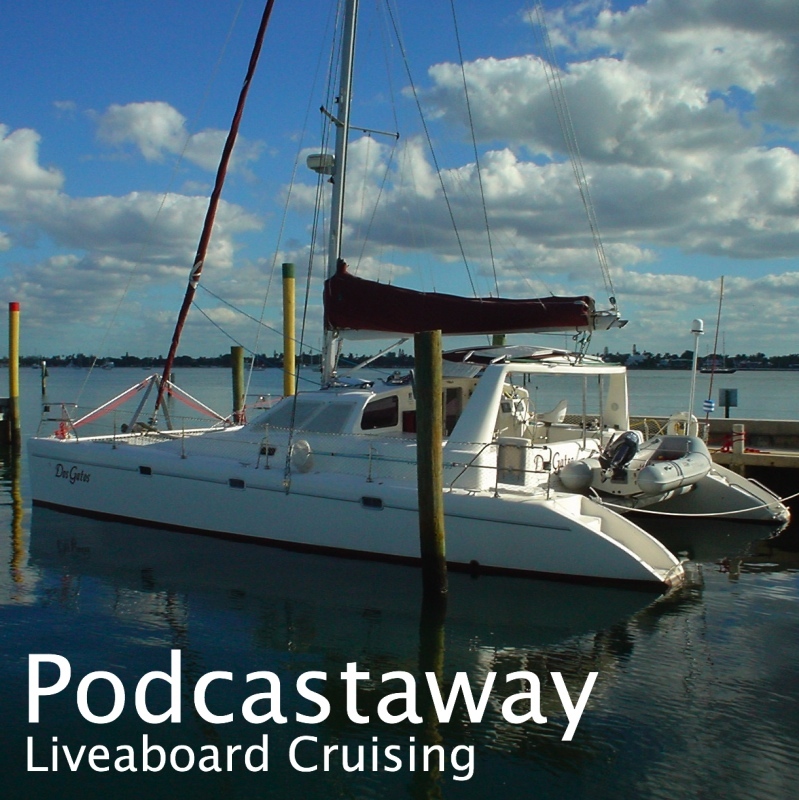 After scrambling to finish various jobs, such as commissioning our new generator, we moved out of Coral Cove Marina and spent around a week anchored out nearby to test our systems with the shore umbilical detached. Last year we were forced to return from this checkout to replace our batteries. We sailed out of Trinidad on Wednesday 15th headed for Los Tesigos. Cruisers are advised to stay well off the Venezualan coast of the Paria Penninsula for security reasons. Some say 12 miles, others say 20 miles. We over-reacted and stayed 30+ miles offshore! We had a strong current with us and a good breeze with the result that we reached Los Testigos too soon. At 2am we were 10 miles off and, unable to slow enough, we considered skipping Los Testigos and heading on to Margarita. Happily, after sailing around the islands we were only 4 miles down wind of the anchorage at dawn. So we turned and motored in. There are only a few fishermen living on Los Testigos, plus a detachment of Venezuelan Guardacosta. We checked in with the Guardacosta as we had not yet cleared in and needed their permission to delay our onward passage to Margarita. They gave us 3 days. Although the anchorages are a bit rolly, they are very pleasant and we rested and snorkelled there. On Saturday 18th we sailed to Margarita and anchored in Parlomar. Parlomar is a surprisingly large city with excellent shops and services. According to the morning VHF net, there are currently 100+ boats in the anchorage. On Monday 20th, we cleared into Venezuela, employing an agent to navigate the tortuous Venezuelan beaurocracy. Where are we? Click on the World Map link below.